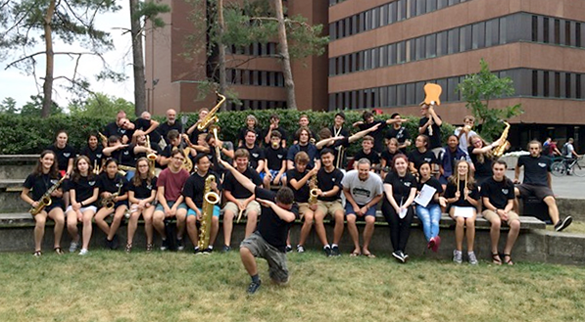 Carleton University is proud to present its 9th annual Jazz Camp from July 29 to August 2, 2019. Thank you for your interest in the Carleton University Jazz Camp! We are encouraging musicians 12 years of age and older to come and hone their skills with some of the finest jazz educators in the country. Jazz enthusiasts from beginner to advanced are welcome. We have special programs designed for those who are just getting started, and for those who are more advanced. All ages from 12 and up are welcome. Each year we welcome a blend of students from grades 7 and 8 through to university level, and adults through to seniors. Everyone is welcome! There will be a final student concert on Friday, at 7pm in the Kailash Mital Theatre in Southam Hall on the Carleton University campus. Each ensemble from the camp will get a chance to perform for family, friends and the general public. Camp hours are Monday to Friday, 9:00 a.m. to 4:30 p.m.
A special thanks to Musicare and the Ottawa Jazz Scene for the their help and support of the Carleton University JazzCamp. CUJazzCamp is proud have received two full scholarships from the folks at JazzN.ca. These two scholarships will be presented to local grade 8 students as selected by Musicest Canada, and the Ottawa Carleton District School Board Gr 8 All-Star Band Directors.